Outlined by delegates from 30 countries! On March 08-10, 2016, the World Forum "Communication on Top" was held for a seventh time in Davos. "A Great Event and a Memorable Experience!" • 1500 tweets on #WCFDavos + over 3 mln impressions by ONLY 100 of them! • 26635 *likes* generated ONLY by the real-time official FB posts! 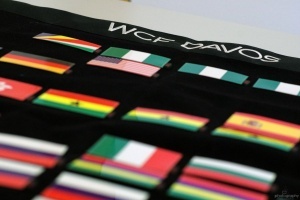 The #WCFDavos community expanded, accepting remarkable experts from several new countries: Macedonia, Nigeria, The Seychelles. The largest delegations were from Russia, India, and Italy. Country reputation – Who is in charge of communications, identity and trust? - Reputation is central for presenting a country as an attractive investment opportunity and tourist destination, since a strong brand definitely assists meeting the country’s domestic priorities. - Government and citizens are both responsible for the country's reputation. - Communicators need to go from mere presentation to engagement and exposure for greater credibility. - When presenting a country brand, reality needs to be discussed with both its positive and negative aspects. Being honest and transparent, communicators can help to solve problems and make improvements. Conclusion: In our fast-changing and globalized world, country reputation remains critically important, but should be transparent and open, so governments need to work and engage with other voices in traditional and social media. - All professional bodies need to work closer together and boost the PR profession by setting and updating standards and priorities. - Sharing best practices will help achieving more business goals by companies where PR is implemented in a structured and professional way. - Stay connected, the exchange of thoughts & ideas will come automatically. - Necessity for a greater shift towards a more ethical media reality. - Larger presence of women in the field of business communication. - The digital world (and the 2011 constitution of Morocco) opened the doors for a growth of freedom of expression. - The future impact of activism as a comprehensive strategy including traditional, social media, and direct communication. - Ethical aspect of the Media-Business relation: the important role of the Business community, often wrongly interpreted as censorship, control or sponsorship. - 4 essential qualities to hire for: COURAGE, CURIOSITY, INTEGRITY, EMPATHY. - The most wanted skills in the PR agency of the future will be those related to the jobs of data-analysts, storytellers, animators, and stand-up-comedians. - Big Data is crucial, as people who have the big data will give the best insight, and the best insight will lead to the best strategy – PR firms without a Chief Data Analyst are about to lose the battle. - Storytelling, in turn, needs to evolve into more visual, animated, emotional and empathic content. Check out all the upcoming events for 2016 here. - Old behaviour rules do not fit new conditions. Old habits & routines no longer make sense. - With humanity standing at the verge of a next Industrial revolution, communication - as an integral part of human evolution and progress - needs to handle the guiding through all changes. - Primary enablers of Industry 4.0 and the Robot Revolution: Internet of things, Social Media, Knowledge Economy, and - Communication, which binds all the others together. - Clients use modern techniques, so marketing in tourism needs to follow. - Necessity of new, smart media platforms empowering users to make decisions and select a holiday! - Tourism communications shift from internal/local to global. - Staff qualifications should reflect the constant changes in customer behaviour. - Keeping-up with modern communications in terms of service development is a 'must'. - Active social media presence! Quantity or Quality – What is today’s Social Media Priority? - Let go off the old ways of control and don’t be afraid to fail! - Be authentic and quick, be amazing! - Great importance of data analyses and Big Data. - Stay on top of the real-time framework that social media entails! - Social & Mobile are merging – by 2018, video will account for over 2/3rds of mobile usage. - If FB were a country, it would be the most populous one in the world. Measure your outcome (not efforts), your website-survey duration (not visits), your social media engagement (not fans), do not be afraid to fail and beware of the dark social. Education in Communications – How to be prepared for the Future? - Complex Problem Solving, Critical Thinking, and Creativity! - Using education curriculum as a gap-bridging tool between theory and practice, rather than as a laboratory for creating capabilities. - What once worked is no more: the youth no longer accept communication from authority. - Advanced, new, incoming and successful education must be handled on the basis of 'real field education' and 'in partnership with professionals'. - Be a savvy media user! - Follwo the US scientists example: they tell their own stories instead of relying on traditional media. - False media-balance in coverage of climate-change: sceptics on global warming (GW) are not given a voice, due to the overwhelming scientific consensus on GW. - Journalists’ independence VS commercial success chased by media! - Responsibility to carry news that has true merit! - Media Influence: its impact that can draw and sustain public interest, change the discourse around a policy debate, aid/question or hinder the players’ cause by highlighting their role in the policy-making. - Media Responsibility: nail the important issues on its agenda, invite experts to speak on them, and properly frame the opposing position! In the first stage the jury determined the candidates for each nomination. In the second stage the voting members of the jury evaluated the nominees based on five criteria: effectiveness, influence, trend, integration of solutions and social convenience.